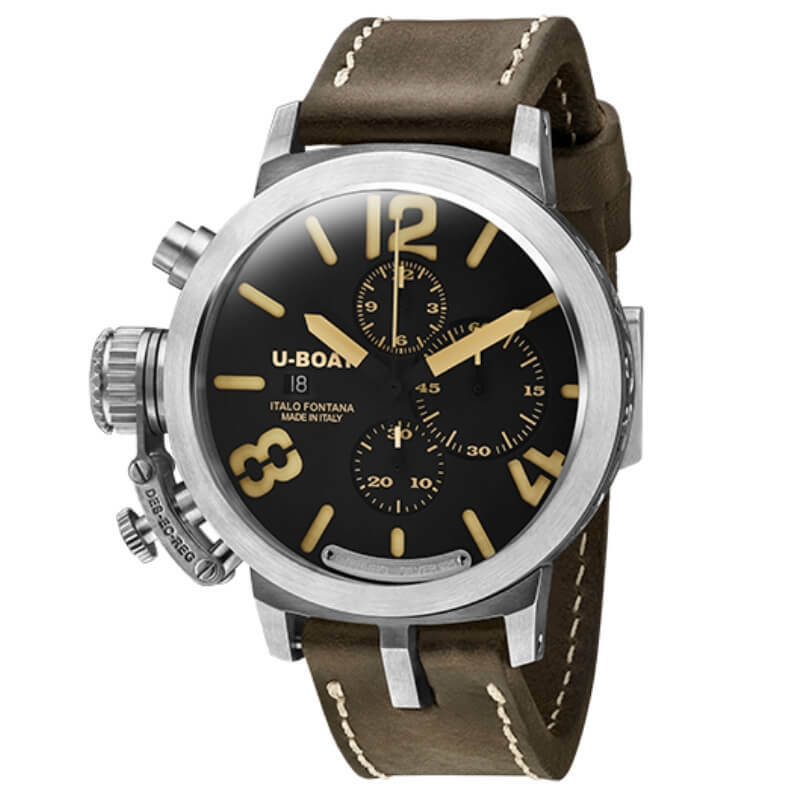 Automatic mechanical chronograph modified and personalized to U-Boat specifications for date display and stem position at 9 o’clock. Power reserve: 44 hours. 25 jewels. Height: 7 mm. Hours, minutes, chronograph, counter small seconds at 3, counter 12 at 12, counter 30 minutes at 6. Date at 9 o’clock. Frequency: 28.800 vibrations per hour, 4 Hz. Sterling silver, crown on left side, with a special protective device. Diameter: 48 mm. Case silver weight: 120 gr approx., central horn welded to the case. Sealed with 8 external screws, with small crystal sapphire showing the movement balancer. Two superimposed dials, one in beige, the other one cut, treated with composite black pigments. Arabic numerals. Luminova beige hands. Plate with engraving positioned at 6 o’clock. High quality, flat sapphire, scratchproof. Hand made and hand finished calf dark brown leather. Width: 23/22 mm. Tongue buckle in silver.